The Vacuum Suction attaches the machine onto the surface of the cement wall / lumber plywood / stone / metal firmly and directly free of extra fixing devices. The GPD-231 is more convenient than the Portable Magnetic Drilling Machine. The GPD-231 Portable Drilling Machine (Vacuum Suction Type) can replace the Portable Magnetic Drilling Machine and is used on various coarse and flat surface. Max. Drill Bit Length: 5"
Drilling Bore Size : 43 mm or 1-5/8"
Hose Size : 6.5 mm or 1/4"
The conventional suction can only apply to smooth surfaces, but the novel vacuum suction fixing base can apply to wet and coarse flat surfaces such as cement wall, lumber plywood, stone back, etc. The workpiece and the machine are attached firmly and closely by the vacuum suction, so no moving workpiece bothers the worker. The air source shared by the vacuum suction and the machine demands one vent pipe only. Don’t need two air sources. The machine has stepless speed regulation and the max. free speed is 1,500 rpm. The water yield is valve-controllable and the water comes from either the drill chuck or the bores. The Drilling Depth Control design can show or setup the depth that you are drilling. The ON/OFF switch controls over rapid and slow feed / escape. The Drilling Machine can work with the small 4 HP air compressor without the additional vacuum pump (vacuum generator). 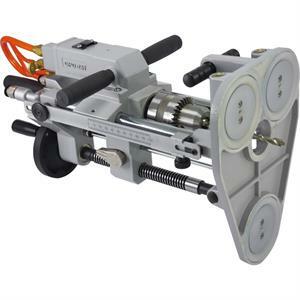 The GPD-231 Portable Drilling Machine (Vacuum Suction Type) can replace the Portable Magnetic Drilling Machine and is used on various coarse and flat surface. 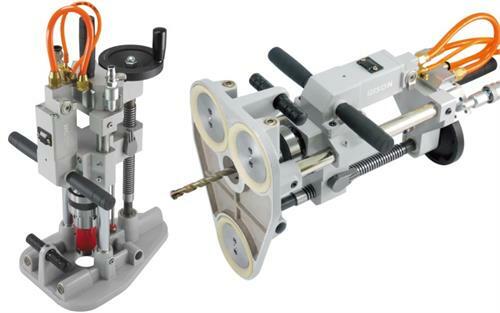 The Portable Magnetic Drilling Machine can be only used on iron material.